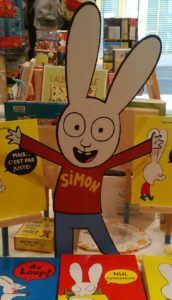 Order a Simon POS Pack – Bounce Sales & Marketing Ltd.
It’s Simon! The cheeky rabbit who knows just what he wants is now on Milkshake TV on Channel 5. Catch the eyes of Simon’s young fans with this POS material for promotions and giveaways—a striking Simon cut-out, a cheeky counterpack, and Poo Bum badges to giveaway alongside a book purchase. Order twelve copies of Nits! to receive a counterpack and Simon cut-out. Badges are available now!